Last week, Kanye West polished off his 2nd night at Madison Square Garden with a short monologue to the sold-out crowd. Mr. West has been doing this at all of his Glow In The Dark stops lately, so this wasn’t out of the ordinary. Apparently, he was talking about how he is trying quit being so selfish and keeping all the good beats for himself. Since pride is something he doesn’t have any issue with, Kanye asked the New Yorkers if they would like a sample. What they didn’t know, is who the beat was for. BLUEPRINT 3 from kwest on Vimeo. I like it. He even throws in a jab at the bloke from Oasis. 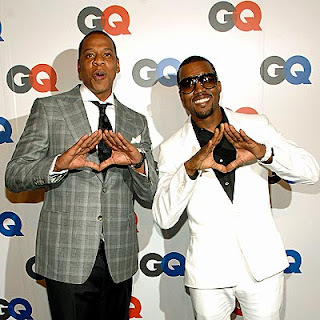 It sounds more Blueprint 2 than Blueprint, but I’ll take any Jay/Kanye collabos. This means that Timbaland won’t be producing Jay’s next entire album. It would be nice, but I’m sure that will happen as soon as Tim and Dr. Dre work on “Chairmen of the Boards” and right after Nas and DJ Premier get back together. The Blueprint 3 is Shawn Carter’s last album on Def Jam and is slated to feature No ID on the boards as well. I don’t expect this link to last longer than a day, so get it while its hot.